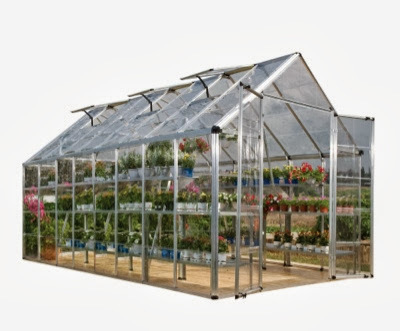 My Home and Garden: I'm thinking this lovely greenhouse would fit right beside the other. I'm thinking this lovely greenhouse would fit right beside the other. This summer I cleared out the wild area / snowberry garden. It left me with about 200 shady square feet. I measured and this 8 x 16 foot greenhouse would fit there right beside my old greenhouse. It would give me a total of 8 x 28 feet under glass. Wow. I need to do something about the hedge from hell to get some sun in this location. When that is done, I'd be free to do this. I would build a brick wall 2-3 feet tall and set it on the wall. That would make it really tall for tomatoes and my precious citrus fruit trees. It really sounds like I've made the decision doesn't it. But first the hedge. My nemesis. My nemesis.